If you follow me on Instagram, you may have seen that I have been under a lot of stress lately, with the freelance work I am doing for a local PR company really kicking it up a notch as their event arrives this weekend. I have been burning the candle at both ends, and have generally been taking on a little too much work, meaning I haven’t been as active on my own social media accounts, and have been feeling a bit run down and anxious. Last night, I headed over to Be At One Bournemouth, for an event with the Bournemouth Bloggers. We were being provided with a VIP demo of their new summer cocktail menu, and it could not have come at a better time, I needed a good cocktail to de-stress! 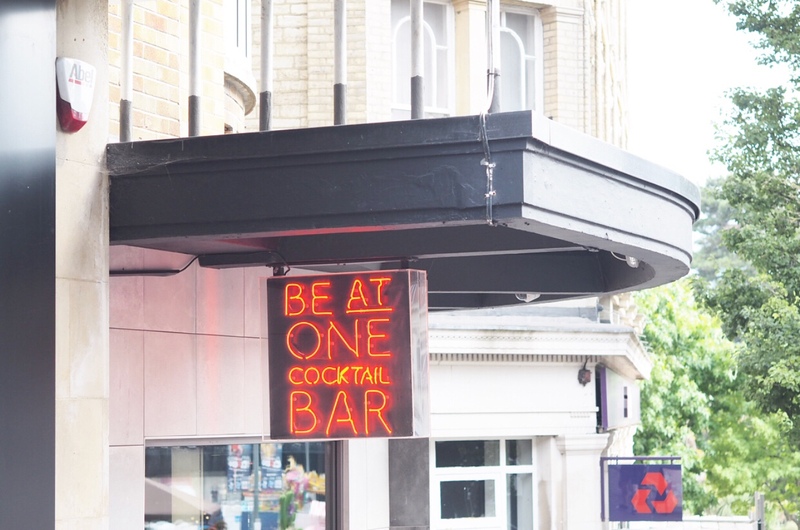 Be At One run a chain of bars across the country, although unlike some franchises, they are passionate about employing people based on their personalities rather than simply their ability to make a cocktail. This totally pays off, as our barman for the evening, James, kept us entertained and interested for the duration of the evening. We were allocated a section of the bar, but being early evening on a Thursday, the venue wasn’t too busy and we were able to chat with other members of staff as well as James. Everyone seemed to really enjoy their job, and James explained it was down to the ethos of Be At One, making the atmosphere for both staff and customers relaxed and friendly. We were handed a Bellini and joined by Joanne, who runs the marketing for Be At One, before James ran through the new summer cocktails, and went into a little more detail about what makes their drinks stand out from the competition. Finishing our drinks, we were asked to look through the menu and choose a cocktail to try. I didn’t have to look very hard as I had been to the venue before and fancied a Pornstar Martini. As our group was quite small and we all knew each other, we were able to try out each others, and I loved the Blueberry Muffin and the Jet Pilot – so strong! James encouraged us to get involved, and we tried our hand at shaking our own cocktails, which was a lot of fun. It was lovely to see the cocktails being made in front of us, and we managed to get lots of boomerangs as James expertly mixed, muddled and stirred our drinks. For our second drinks, a lot of us went for more of the ‘dessert’ style cocktails, with Harrison opting for the aptly named ‘On the Wagon’ (its non alcoholic, as he was driving), Liz had the Popster ( with popcorn) and Zosha went for the Crunch Time (with a Crunchie) and Mel the Buenot (with Kinder Bueno) – chocolate and cocktails, what more could you want? I wanted to try something a little different, and ended up going for the Petty Filoo, Be At One’s take on the popular yoghurt from our childhood. I got a bit anxious when I was presented with it, as I don’t like milk, and it looked very milky, but actually it was delicious, and didn’t taste of milk at all! As well as the fact it contained pink gin (I am a total convert now), I was drawn to it as it looked so much fun, and I couldn’t stop taking photos of the totally adorable design – it’s made up to look just like a yogurt lid! After we had finished our drinks, we bid farewell to Joanne and James, and headed home, but I will definitely be back again soon as there were so many cocktails I would like to try! If you have a Be At One bar near to you, I would highly recommend a visit. The Bournemouth branch is located opposite Slug & Lettuce, just up from the main square, and has a lovely intimate vibe to it, a lovely retro soundtrack and the cutest toilet decor I have ever seen (totally instagrammable). I was invited along with the Bournemouth Bloggers for the purpose of this review post, however all opinions and photos are my own.